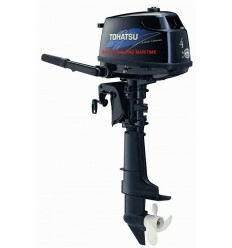 Tohatsu Outboards 2.5 HP - 6 HP There are 16 products. 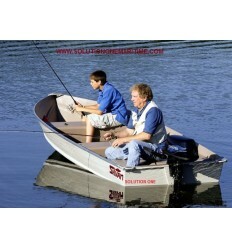 Tohatsu Outboards MFS2.5BS 5 Year Warranty The new 2.5hp outboard is portable and powerful. Plus, with features such as the throttle grip on the steering handle, forward neutral shift and the 360 degree pivot steering, maneuvering out on the water has never been easier. Tohatsu Outboards MFS3.5BS 5 Year Warranty The new 3.5hp outboard is portable and powerful. Plus, with features such as the throttle grip on the steering handle, forward neutral shift and the 360 degree pivot steering, maneuvering out on the water has never been easier. 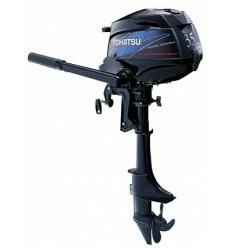 Tohatsu Outboards MFS3.5BL 5 Year Warranty The new 3.5hp outboard is portable and powerful. Plus, with features such as the throttle grip on the steering handle, forward neutral shift and the 360 degree pivot steering, maneuvering out on the water has never been easier. 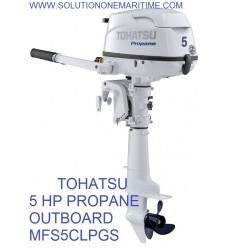 Tohatsu 5 HP Propane 4-STK Short Shaft [MFS5CLPGS] Free Shipping Thanks to Tohatsu’s 5hp Liquefied Petroleum Gas (LPG) outboard, sailors are no longer forced to carry gasoline on board. The 5hp LPG comes equipped with a fuel line that will connect to any standard North American propane tank. Tohatsu 5 HP Propane 4-STK Long Shaft [MFS5CLPGSPOL] Free Shipping Thanks to Tohatsu’s 5hp Liquefied Petroleum Gas (LPG) outboard, sailors are no longer forced to carry gasoline on board. The 5hp LPG comes equipped with a fuel line that will connect to any standard North American propane tank. Tohatsu 5 HP Propane 4-STK Ultra Long Shaft [MFS5CLPGSPROUL] Free Shipping Thanks to Tohatsu’s 5hp Liquefied Petroleum Gas (LPG) outboard, sailors are no longer forced to carry gasoline on board. The 5hp LPG comes equipped with a fuel line that will connect to any standard North American propane tank. Tohatsu Outboards MFS6CSPROL SAIL PRO 5 Year Warranty The 6 hp 4-stroke provides all the power you need for boating. This engine does that as well as providing fuel efficiency second to none and a newly redesigned carrying handle and holding grip make it convenient to transport! Tohatsu Outboards MFS6CSPROUL SAIL PRO 5 Year Warranty The 6 hp 4-stroke provides all the power you need for boating. This engine does that as well as providing fuel efficiency second to none and a newly redesigned carrying handle and holding grip make it convenient to transport!